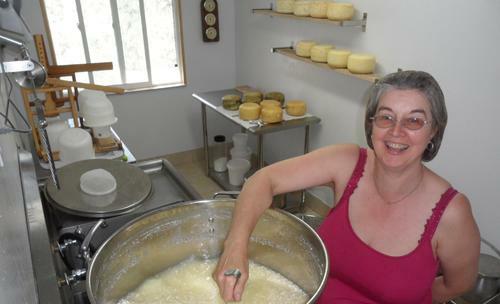 Anita de Boer produces cheese at the couple's Rochester farm. If you stop in at Spud’s Produce Market around closing time, you might see owner Dave Jekel bent over their stash of local cheeses. Jekel says he often goes home with a wedge of Tunawerth Creamery’s Garlic and Parsley Gouda. He loves to slice some onto sandwich bread and melt it under the broiler. When it’s available, that is. Jekel and his wife, Karissa, started carrying Tunawerth milk not long after they opened the store in August 2012. They later added the creamery’s hard cheeses and then their yogurts. Jekel says the products are popular, but there’s another reason they continue to stock the Rochester farm’s goods in the store. Anita and Peter de Boer started Tunawerth Creamery and its companion, Frisia Dairy, four years ago. The 36-acre farm had been a dairy previously but was non-active for five years before the de Boers starting renting it. After operating it for two years, they purchased the farm. 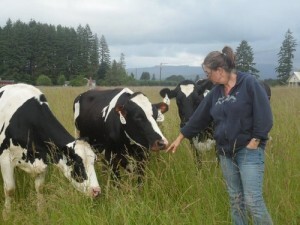 Dairy farming was a longtime dream for the two, who left their home country of The Netherlands almost two decades ago. Like many food artisans, the de Boers’ keep the specifics of their process to themselves. They will only say that it’s a classic technique and is, for them, reminiscent of home. Some creameries buy their milk from other sources but the de Boers use milk from their own cows. Ten of the 88 Frisia Dairy cows are designated for the creamery. Anita asserts that the best milk to process into cheese and yogurt, is that from the morning milking – and they use it as often as possible. Tunawerth Goudas are flavored with such things as cumin, red pepper and jalapeno, or nettles. 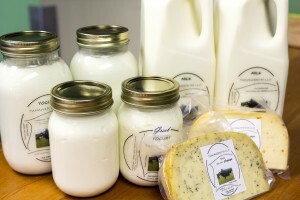 Spud’s also carries two types of glass-jarred yogurts: a classic, whole-milk plain yogurt and Greek yogurt. The latter is one of their newest products, debuted just four months ago. Anita says sales are growing and Dave Jekel says they started with just a few jars but sales picked up quickly. The warm reception by local consumers correlates with the Greek yogurt phenomenon of the past decade. According to a recent article in The Wall Street Journal, Greek yogurt now comprises more than half of all yogurt sales nationwide. But in contrast to many products on the market, Tunawerth makes its Greek yogurt the old-fashioned way, by straining out much of the whey to obtain a thicker, creamier texture. A number of commercial brands use additives to achieve the same effect. Anita and Peter are dedicated to traditional practices with their other products, too. Their hard cheeses are made with raw milk and aged for 60 days. Yogurts are made from raw milk and heated later as part of the thickening process. Their bottled milks are low-pasteurized, held at 145 degrees for 30 minutes. Anita says in contrast with higher-temperature pasteurization processes, low-pasteurization kills bacteria while keeping beneficial enzymes alive. Anita de Boer produces cheese at the couple’s Rochester farm. Though not certified organic, the creamery follows organic practices, as many small producers do. Their dairy cows are fed on grass whenever possible and the cows’ diets are supplemented with GMO-free barley and canola, which is organic whenever possible. During the winter months, the cows dine on grass the de Boers harvest and dry themselves. All the manure from the farm is used as fertilizer. Tunawerth’s Gouda cheeses, milk, and yogurts are available at Spud’s Produce Market. The creamery also makes feta cheese, cream cheese, and ricotta (plain as well as a version that’s brined in red wine). A batch of Truffle Gouda is aging.